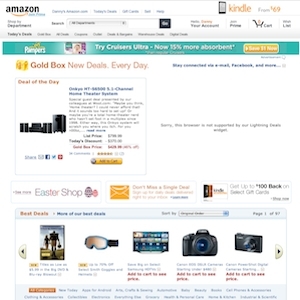 Amazon.com was founded in 1994 and is one of the most popular shopping destinations on the web today. Amazon's gold box deals are by far some of the best daily deals being offered on the web today. The deals include a main deal, side deals as well as lightning deals which are updated at intervals throughout the day. In addition to this, Amazon has expanded their daily deal offerings through additional web properties such as AmazonLocal where you can purchase local deals and national deals, and Woot (which they acquired in 2010) which is a one deal a day website where you will occasionally find deals offered by Amazon.com. Amazon.com currently ranks #1 amongst sites offering online deals. In the General Merchandise category, Amazon ranks, once again at #1.